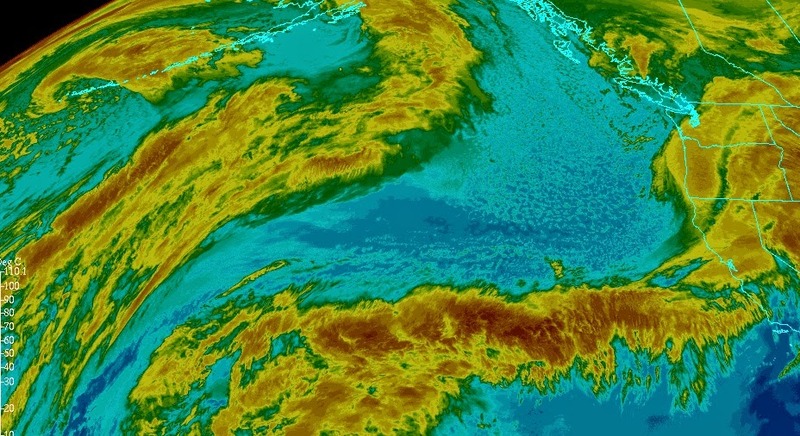 A powerful cold front is dropping out of the Northwest right through Tahoe. This storm will bring with it heavy snow at times. It will, however, be pretty fast moving. I see every indication that we will be on the upper end or exceed my 6-9 inch prediction of a few days past. Below is the current Satellite. Their is plenty of moisture to tap into. The only thing keeping this from being a Pinneapple express is the lack of a blocking system to stall our front. However, as it is, I see about a foot of snow and maybe even more for Slide Mountain. About the same for the rest of Tahoe as snow levels will be at or below Lake level. This system will be all done by noon tomorrow and behind it look for high pressure to take over. Do not, however, look for warm temperatures like we have seen this week as it will remain cool until the the next storm moves in next week. As I mentioned in my last post I am tracking a pretty good system coming our way right after the first of the year. Here is why I am encouraged. 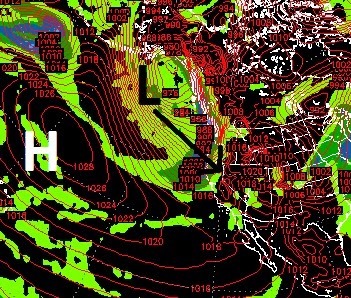 Take note of where that ridge of high pressure is as this storm is going squeeze down and send it south and west. The above is the forecast for January 2nd. 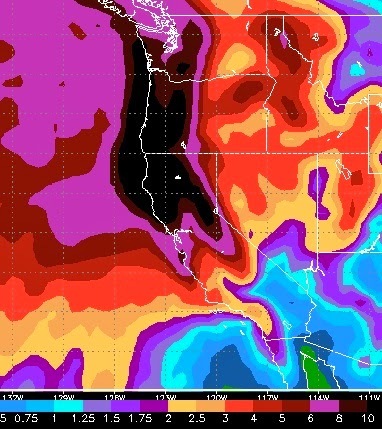 I am looking for a decent storm on or around the 3rd of January to hit Tahoe. Most of Tahoe is in the 8-10 inch precip area. With colder air that could translate into 10-15 feet of snow. What a fantasy for us skiers and riders! Merry Christmas and Happy Holidays to all ... safe travels!